How Are Department Stores Faring in 2014? After half a year of results, how do the big department chains match up going into the busiest time of the year? Back to school is already here, and Black Friday and the holiday shopping season are both just around the corner -- sorry to be the bearer of bad news. While that may mean stress and suffering for shoppers and their pocketbooks, it means big sales for department stores. Companies spend the first half of the year getting their houses in order to cash it all in in the second half. Building a strong brand and generating foot traffic early can make or break a business when September rolls around. Now that second-quarter results have piled up from major chains, here's a look at how everyone did and who's best positioned to make a strong showing as we end the year. When we're talking about department stores, we're mainly talking about J.C. Penney (NYSE:JCP), Macy's (NYSE:M), Nordstrom (NYSE:JWN), and Dillard's (NYSE:DDS). These companies have combined annual sales of over $55 billion, with Macy's leading the way, bringing in $27.9 billion in revenue last year. As you can see in the chart below, revenue growth at all the businesses has been hit or miss over the last year. Notable trends, though, are Macy's overall positive revenue growth and J.C. Penney's return from the dead. M Revenue (Quarterly YoY Growth) data by YCharts. Even though Macy's has been strong, in the first half of this year, it hit its biggest roadblock in recent memory. Comparable sales dropped 1.6% compared to the first quarter in 2013, pushing total sales down 1.7%. Comparable sales are an excellent guide for investors, as they tell the story not just of how much a company is growing, but of how strong its individual locations are on average. In the first quarter, many of Macy's locations were hit with bad weather, pushing sales down. The business rallied in the second quarter, but lowered its annual forecast as it seemed unlikely to overcome the first quarter's troubles. J.C. Penney has been making the most of its comeback in the first half. Comparable sales have jumped 6.6% in the first half of this year, and gross margin has climbed up 4.3 percentage points. The increase in gross margin indicates that J.C. Penney isn't having to discount merchandise to get that comparable-store sales growth -- great news for investors. Nordstrom and Dillard's aren't having a particularly bad or good time. Comparable sales at Dillard's rose just 1% in the first half of the year and gross margin fell slightly. The company disappointed the market in its second quarter, as the small decrease in gross margin has been seen as a reflection of the whole retail segment. Even so, the stock is up 10% year to date due to the company's strong first-quarter showing. The headline Nordstrom put on its news release regarding its second-quarter results says almost everything about the business -- "Second Quarter 2014 Earnings in Line with Expectations." 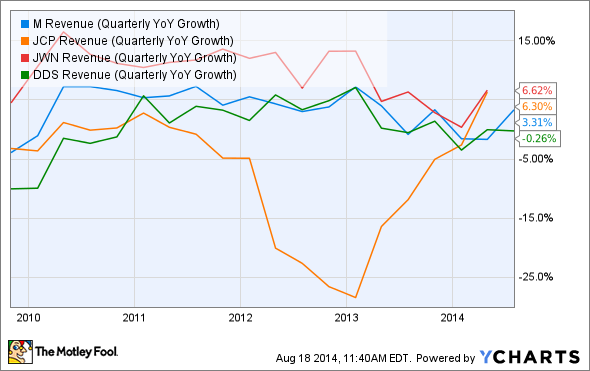 Nordstrom, like Macy's and Dillard's, had a boring and slightly disappointing second quarter. While the company hit its own estimates, Wall Street was looking for more. The retailer countered some of its lackluster performance by increasing its sales and earnings forecast, though, keeping the stock from falling off a cliff. An investor looking across all of these retailers is going to find one common thread -- the beginning of the year was the tough part. Even J.C. Penney, which has been on the rise, had a relatively difficult first quarter due to a "highly competitive environment" and its need to discount to clear merchandise and drive in customers. All four retailers are looking forward to the second half, but the market isn't yet upbeat about it. As some retailers have dropped their annual forecasts, the market is holding off on these companies. Over the last three months, the market has dropped its valuation of all three of the department stores that actually have earnings -- J.C. Penney is still losing money each quarter. 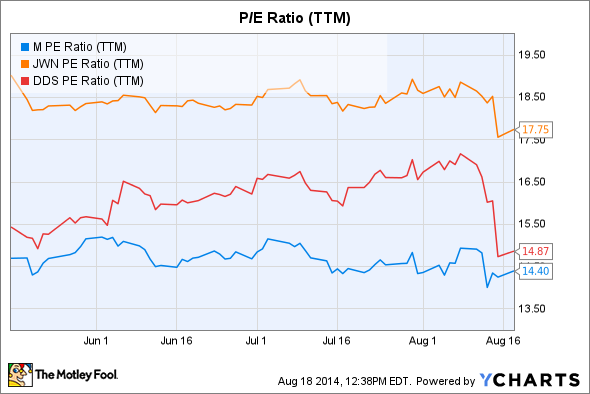 M P/E Ratio (TTM) data by YCharts. Who's set up to win in the second half? Going into the end of the year, I like Macy's chances best of all. While J.C. Penney has the momentum, it also has expressed concern about the second half as the competitive environment might put a pinch on its clearance items and hurt gross margin. Macy's has a good line-up for the end of the year, and its solid growth in the second quarter points toward a strong second half. Additionally, Macy's has trimmed its inventory down to keep clearances to a minimum in the second half. Combined with its online and mobile initiatives, like buy online and pick up in store, Macy's should have a solid handle on its distribution in the second half of the year. Back-to-school sales have already shown strength for the company, with the company's junior division having now "turned around," according to management. None of these four is likely to have a horrible end of the year unless the market takes another sharp turn toward competitiveness. That would happen if consumer spending failed to increase, or if there was a substantial stumble in the jobs market. Right now it looks like smoother sailing, and all four businesses should be in a better place come the end of December.